The PAC office of the Illinois Attorney General had taken the position that its nonbinding opinions and rulings on requests for review were not subject to administrative review by the circuit court. That position was recently rejected by a Cook County Circuit Court in Garlick v. OPRF, et al. 11 CH 7587 (July 17, 2012). The case involved a request pursuant to the Illinois Freedom of Information Act for the attorney invoices of the school district. Although the district provided the invoices to the requester, it redacted certain descriptive information under the attorney-client communication exemption. After receiving the redacted invoices, the requester appealed to the PAC. The PAC upheld the school's action in a "non-binding" opinion, and the requester subsequently filed a complaint in circuit court against the school district and the PAC. The PAC moved to dismiss the complaint, arguing, among other things, that a non-binding opinion is not reviewable in any court. The trial court denied the PAC's motion to dismiss, in effect holding that a nonbinding opinion of the PAC is subject to administrative review. The PAC was forced to defend its opinion on the merits and was unable to shift the burden of defending the case to the school district. City Ban on Fortune-Telling "Not in the Cards"
A Louisiana court recently ruled that a local ordinance banning fortune-telling, palm reading, astrology, and similar uses was unconstitutional, since such activities were free speech protected by the First Amendment. Adams v. City of Alexandria, No. 11-1484, 2012 U.S. Dist. LEXIS 97059 (W.D. La. July 11, 2012). The plaintiff, a psychic, had filed a lawsuit against the city claiming that the local ordinance ordinance was arbitrary, capricious, overly broad, vague, and unconstitutional. The court agreed with the psychic, finding that the ordinance did not pass strict scrutiny review. First, the court held that the city's stated purpose for the ordinance (to prevent fraud and misleading the public) was not supported by the facts of the case. Second, the court determined that the city had alternative means of addressing these issues through enforcement of other laws, including theft and unfair trade practices. Thanks to the International Municipal Lawyers Association for reporting on this case in the July 25, 2012 edition of the IMLA Newsletter. If signed by the Governor, Illinois SB 3406 would require municipal officials to include on any notice of violation of a building code (1) a citation to the specific code provision alleged to be violated and (2) a description of the circumstances giving rise to the violation. This is a change to the current language that requires violation notices to indicate "the type and nature of the violation." Code officials and others who write up these violation notices should be advised that beginning January 1, 2013, they will need to provide more detail about the violation and cite the specific code section or sections being violated. The same requirement applies to notices of violations of sanitation ordinances. We first reported on HB 222 on May 31, 2012. That bill has now been signed by the Governor and, effective January 1, 2013, P.A. 97-044 will require all municipalities, townships, and counties, including home rule units, to provide additional data for all employees to the State's Central Management Services for inclusion in the Illinois Transparency and Accountability Portal (ITAP), the state's searchable online informational database. The reportable data includes the names, titles, current pay rate, and year-to-date pay for all municipal, township, and county employees. The CMS intends to post this information on the ITAP database, which is made available to the public. Although the law does not provide any detail about how often the government body must supplement this data, the requirement of "year-to-date" pay data suggests that information must be supplemented on a regular basis. Plaintiff filed a complaint with the State Board of Elections, claiming that the Citizens for Wilmette Schools (a political committee under the Election Code) violated the Illinois Election Code by failing to timely disclose an in-kind contribution. The alleged "contribution" consisted of volunteer work by a self-employed graphics and website designer to design a website for the political committee. According to the complaint, these volunteer services were valued at $3,435. Although the political committee had disclosed the contribution on April 15, 2011 in its quarterly report to the Board, the plaintiff claimed that was untimely because the Election Code requires any contribution in excess of $1,000 to be reported in the thirty-day period before an election, which was held on April 5, 2011. At the preliminary hearing, the committee’s counsel advised the hearing officer that the committee had removed the contribution from its report on the basis that volunteering efforts do not have to be reported as contributions, and that the First Amendment protects an individual's right to voluntarily provide services. The hearing officer agreed and recommended to the Board that no further action be taken on the complaint. The Board dismissed the complaint, finding that plaintiff's complaint was not filed on justifiable grounds. On appeal, the appellate court upheld the Board’s dismissal of the complaint. Herbert Sorock v. Illinois State Board of Elections and Citizens for Wilmette Schools, 2012 IL App (1st) 112740, (July 13, 2012). First, the court determined that while Gottlieb did create the website, she had nothing to do with the contents of the website. The court held that the volunteer time and contribution were not “electioneering communications” under the Election Code. Second, the court expressed concerns about First Amendment protections. If volunteering time were construed as a contribution, and reporting were required, the names and addresses of these volunteers would be subject to public disclosure. Requiring the reporting of all volunteering efforts could have a chilling effect on a person’s right to association. Post Authored by Perry Kendall, Ancel Glink. In previous blog posts (May 7, 2012, April 17, 2012, and February 23, 2012) we reported on HB 4687, the bill that would require public body meeting agendas to identify the "general subject matter" of an ordinance or resolution to be voted on at a meeting. That bill also requires public bodies to ensure that meeting notices and agendas are continuously available for public review during the entire 48 hour period before a meeting. Yesterday, the Governor signed HB 4687 into law as P.A. 097-0827. You may recall that we had raised concerns about previous versions of this bill that would have required agendas to be "sufficiently descriptive" regarding any item that would be acted on or even discussed at a public meeting. The legislation is now limited to ordinances and resolutions that are to be voted on at a meeting. The language requiring public bodies to make sure that agendas and meeting notices are "continuously available for public review" for the 48 hour period before a meeting remained in the legislation. Many public bodies may encounter some difficulty in complying with that particular amendment. For example, many municipalities post their agendas and notices inside city or village hall. If city or village hall is not continuously open to the public for the 48 hour period prior to a meeting, however, the municipality will need to find an alternative posting area for meeting agendas where the public can view these agendas, apparently at any time of the day or night. Of course, any alternative location must still comply with other language in section 2.02(b) requiring notices and agendas to be posted "at the principal office of the body holding the meeting" or if no such office exists, then "at the building in which the meeting is to be held." That would seem to require a municipality to either (1) keep village or city hall open 24/7 for the 48 hour period before a meeting or (2) post meeting notices outside village or city hall. Alternatively, the public body can post and maintain the agenda and notice on the public body's website and that will satisfy the requirement for continuous posting. Public bodies will have to comply with these new requirements beginning January 1, 2013. While an octopus might hide behind a building on a mural, the mural cannot hide from the sign code of Walla Walla, Washington. Robert Catsiff moved his toy store, the “Inland Octopus,” to a new location in downtown Walla Walla, which is subject to the height, width and permit requirements of the “downtown area” of the Central Business District. 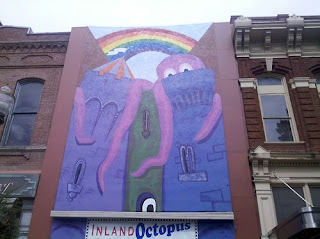 Mr. Catsiff painted on the store front an octopus hiding behind several buildings with a rainbow above the buildings in excess of the City's height and width limits. The City issued a notice of violation, but Catsiff contended that the sign code was unconstitutional. The hearing officer found a violation, and the trial court affirmed, while rejecting Catsiff’s constitutional claims. On appeal, Catsiff contended his mural was not a commercial sign, a fact the Appellate Court readily rejected because the octopus mural plainly related to the economic interests of the “Inland Octopus” toy store. Catsiff v. McCarty, 274 P.3d 1063 (3d Div. Wash. App. 2012), reconsid. denied (May 14, 2012). The Court then concluded Walla Walla met its burden of justifying the restrictions because they were narrowly tailored to protect the City's substantial interest in traffic safety and aesthetics. Additionally, the sign regulations were: 1) content neutral, i.e. absent censorial purpose; (2) reasonable, and (3) supported by a legitimate regulatory interest. Walla Walla's wall sign size and height restrictions are content neutral because they do not limit what a business owner may say or depict in a wall sign. The City satisfied the reasonableness test because the legislative history showed the City carefully considered its sign size and height restrictions. The City’s legislative history showing the wall sign size and height restrictions were adopted as part of a comprehensive plan to address aesthetics and traffic control demonstrated a legitimate regulatory interest. The definitions in the sign code saved the city from Catsiff’s vagueness challenge, and Catsiff’s overbreadth challenge failed because the code did not affect protected speech. On July 11, 2012, the Illinois Attorney General issued a binding opinion finding that a Village Board violated the Open Meetings Act where the personnel and finance committees discussed budgetary matters in a closed meeting. A news reporter had filed a complaint with the AG alleging that the two committees had improperly discussed the Village's budget in closed session. The committees had cited the "personnel" exemption to go into closed session to discuss individual employees. The reporter claimed that the committees also discussed budget cuts. The AG reviewed the minutes and recordings of the closed session meetings and concluded that the personnel exemption did not extend to discussion of fiscal matters even if that discussion would directly or indirectly impact Village employees. Based on this opinion, it appears that the AG would require a Village Board to go in and out of executive session to discuss layoffs of individual employees due to budgetary constraints. For example, if the public body is discussing the relative merits of individual employees in considering layoffs, that discussion may be conducted in closed session. However, the underlying budgetary discussion leading to the layoff decision must be conducted in open session. It is important to note that in its opinion, the AG expressly rejected the Appellate Court's holding in Gosnell v. Hogan, 179 Ill.App.3d 161 (1989). In that case, the appellate court interpreted the personnel exemption as authorizing the discussion of topics that did not clearly fall within the scope of the personnel exemption but which were generally related thereto. The AG relied on language added to section 2(b) of the OMA in 1995 stating that the OMA exceptions "are in derogation of the requirement that public bodies meet in the open, and therefore, the exceptions are to be strictly construed, extending only to subjects clearly within their scope." The AG takes the position that this amendatory language (added six years after Gosnell was decided) was intended to address the court's interpretation in Gosnell. It would be interesting to know how the Illinois Supreme Court would view the AG's decision to ignore binding court precedent in issuing this opinion. In 2006, the County brought an action against George Stamatopoulos to enjoin the operation of his adult merchandise business, Video Magic. The trial court entered an order for the County, and the Appellate Court affirmed in 2008. That same year, Plaintiffs purchased Video Magic from Stamatopoulos and filed a zoning application to operate an adult use establishment; but the County Zoning Board of Appeals (ZBA) denied the application on the basis that Video Magic did not constitute a valid nonconforming use when the Plaintiffs purchased it. On administrative review, the trial court affirmed the denial of the zoning application, and the Plaintiffs appealed. In 2010, the Plaintiffs filed a motion to intervene in the County’s original case against Stamatopoulos. The trial court denied that motion, and the Plaintiffs appealed. The Appellate Court heard the two appeals together in County of Lake v. George Stamatopoulos, d/b/a Video Magic, 2012 IL App (2d) 110232 & 110720-U. Plaintiffs argued that they should be permitted to intervene in the County’s case against Video Magic because they are a successor in interest and the trial court maintains jurisdiction to modify the injunction. However, based on the significant delay between the 2008 judgment and the 2010 motion to intervene, the Appellate Court determined that it was not an abuse of discretion for the trial court to deny the motion. As for the appeal regarding their zoning application, Plaintiffs argued that the ZBA was bound by the injunction against Video Magic, prohibiting it from conducting business until it came into compliance with the adult licensing ordinance. However, the Appellate Court rejected Plaintiffs claims of claim preclusion, res judicata and judicial estoppel were inapplicable because there were not identical issues between the County’s injunction against Video Magic’s adult licensing ordinance violations, and the ZBA’s denial of the Plaintiffs’ zoning application. Next, the Appellate Court accepted the County’s argument that Video Magic never operated as a legal nonconforming use because it failed to comply with the adult licensing ordinance. While not every violation of a licensing statute will discontinue a nonconforming use, where the adult licensing ordinance was clearly designed to assist in the regulation of land use, Video Magic lost its legal nonconforming use status due to failure to obtain a license. Don't Miss This Upcoming Land Use Conference in Chicago! This advanced land use law program is intended for attorneys, professional planners, and government officials involved in land use planning, zoning, permitting, property development, conservation and environmental protection, and land use and eminent domain litigation. The program addresses and analyzes the state-of-the-art efforts by government to manage land use and development. It also presents the key issues faced by property owners and developers in obtaining necessary governmental approvals. In addition, the entire approach of the program is focused on providing practice pointers that give immediate take home value. Ancel Glink partner Julie Tappendorf (a member of the Land Use Institute faculty since 2006) will participate in five panel discussions at the conference, speaking on First and Second Amendment issues as they relate to land use, Development Agreements, Public-Private Partnerships, Conflicts of Interest and Ethics, among other topics. In Morgan Place of Chicago, et al. v. City of Chicago, No. 1-09-1240, 1-10-0195 (June 29, 2012), an Illinois Appellate Court determined that the City was not equitably estopped from revoking a building permit for a condominium development. The court also determined that the developer did not have a vested right to the permit notwithstanding that the property was subsequently rezoned to a planned manufacturing district. In 1993, Cedicci acquired land zoned in the M-2, light manufacturing district. Shortly after the purchase, the property was rezoned to the C-2, which would allow the owner to construct its proposed condominium building above a ground floor warehouse. In 1997, however, the City proposed rezoning the property to planned manufacturing district (PMD), which would allow manufacturing and commercial uses, but prohibit residential uses. Cedicci claims he was not notified of the PMD zoning change. In 1998, Cedicci submitted a permit application to develop a mixed-use (condominium and warehouse uses) on the property. That application was approved by the zoning department, and a building permit was issued in 2000, notwithstanding that residential uses were not permitted in the PMD district. Shortly after construction began in 2004, a City inspector issued a stop work order (SWO) on the basis that the initial building permit had been revoked for inactivity under the City's building code. Cedicci hired counsel to challenge the SWO, and the permit was eventually reinstated in 2004 upon recommndation of the City's corporation counsel, who expressed concerns about vested rights. One year later, the City revoked the building permit because the use did not comply with the City's zoning ordinance, and Cedicci filed a lawsuit claiming it had a vested right to continue with the development and the City was equitably estopped from enforcing the City's zoning ordinance. The trial court ruled in favor of the City, which was recently affirmed by the appellate court. On the equitable estoppel claim, the Court determined that the City official who had reinstated the permit in 2004 on the recommendation of City counsel was not authorized to do so and the City could not be bound to that unauthorized act. On the vested rights claim, the Court determined that the vested rights doctrine presupposes issuance of a legal building permit. In this case, the zoning of the property prohibited residential uses; thus the building permit was never legally issued. Furthermore, the Court determined that the expenditures made by the owner prior to the zoning change were not substantial enough to satisfy a vested rights claim.